Which command can be used to obtain the status of an MGCP gateway from the IOS device, as shown in the given output? 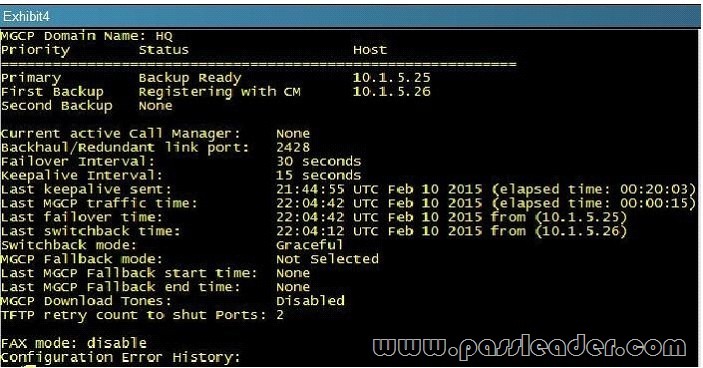 What is the reason that this MGCP gateway is not registered with Cisco Unified Communications Manager? A. The primary server address is incorrect. B. 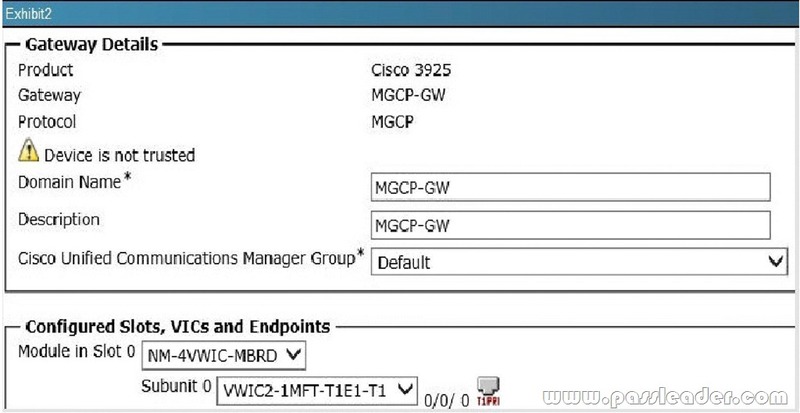 The MGCP domain name is incorrect on either the Cisco Unified Communications Manager or the router. D. This MGCP gateway is not down; it is operational. After making a change to a manually configured MGCP gateway, what step should you take to ensure that the gateway accepts the changes and be operational? A. Issue the commands no MGCP, then MGCP. B. Issue the commands no SCCP. then SCCP. C. Issue the commands Shut, then no shut. D. Issue the commands no CCM. then CCM. An IP phone that is connected through a Cisco Catalyst 3750 Series Switch is failing to register with the subscriber as a backup server. When the user presses the settings button on the phone, only the Cisco Unified Communications Manager publisher shows as registered. What is the most likely cause for this issue? A. The phone does not have the correct Cisco Unified Communications Manager group in the device configuration page. B. The Cisco Unified Communications Manager group that is applied through the device pool is misconfigured. C. The ip-helper address command for the subscriber is not configured on the switch port. D. The subscriber does not have the correct device pool configured. E. The enterprise phone configuration does not have the call control redundancy enabled. Refer to the exhibit. An IP phone that is connected through a Cisco Catalyst 3750 Series Switch is failing to register with Cisco Unified Communications Manager. When the user presses the settings button on the phone, the Operational VLAN ID shows a blank entry. What is the most likely cause for this issue? A. The switch may not be supplying inline power. B. 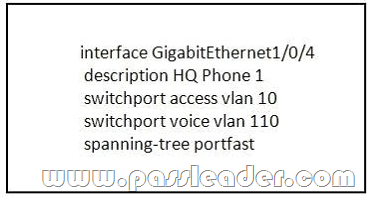 The spanning tree portfast command needs to be removed. C. The trunk encapsulation is missing. The trunk must be configured for dot1.Q. D. Cisco Discovery Protocol is disabled on the switch. E. The Operational VLAN ID of the phone always shows as blank. The Admin VLAN ID should be 110. You configured a Cisco ISR G2 as a SIP gateway, but the gateway does not show that it is registered with Cisco Unified Communications Manager. What is causing this issue? A. Cisco Unified Communications Manager does not support SIP gateways. B. The gateway does not have the UC license installed. C. The gateway does not have Cisco Unified Border Element session licensing. D. Cisco Unified Communications Manager does not show a SIP gateway as registered if it is not properly configured. E. Cisco Unified Communications Manager never shows a SIP gateway as registered even when it is properly configured. F. The Cisco ISR G2 cannot be a SIP gateway. Endpoints are configured for both H.323 and SIP using the same URI and Cisco VCS settings, but the endpoints register only as H.323 endpoints. What is causing this issue? A. A firewall is blocking all traffic from the endpoints to the Cisco VCS. B. The Cisco VCS has no SIP domains configured. C. The Cisco VCS is blocking the endpoints because of duplicate ID entries. D. The endpoints do not have the SIP option key installed. E. SIP does not work, because SIP is used for Cisco Unified Communications Manager registration only.